Warning! 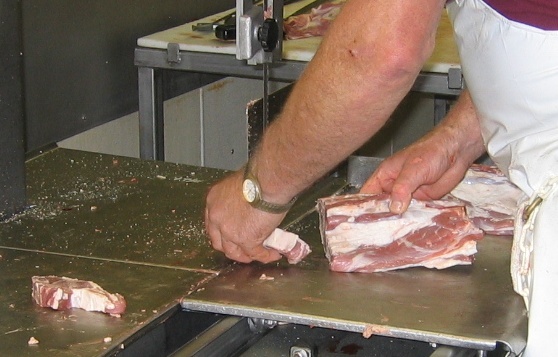 Graphic pictures of food cutting below. You’ve been warned! My Norwegian mother has hosted true Norwegian dinners every Christmas Eve for as long as I can remember. I’ll post all the dishes later, but the center piece was primarily pinnekjøtt. A couple weeks before Christmas my mother would go to Ballard in Seattle, an old hang out for Norwegian expats and buy all the stuff required for dinner, including prepared pinnekjøtt for about fifteen dollars a pound. That was all good until I met Laura as a collegue at IBM. Her father Arvid is Norwegian and would make his own pinnekjøtt by brining and hanging lamb himself every year, right in the middle of the Seattle area. This sounded fun so I gave him a ring and he agreed to walk me through the process. First, you need to find a source of lamb. Not lamb chops, not shanks, but whole, butchered and un-cut lamb. This is harder than it sounds. The first year I tried this we had it easy, there was a butcher in Ballard that specialized in selling lamb cut for home curing. Unfortunately, Ballard grew away from its Scandinavian roots so Norwegian boutique stores didn’t have a customer base anymore. Before going under the butcher told me that they would sell (literally) tons of lutefisk every year. By the time it closed they would only sell a couple hundred pounds. The next year I called dozens of stores and butchers looking for a source of whole lambs. The reaction was amazing, usually that of disgust and anger, strange coming from butchers. But with every call I’d get another contact and eventually found Glen Gyle Farm. 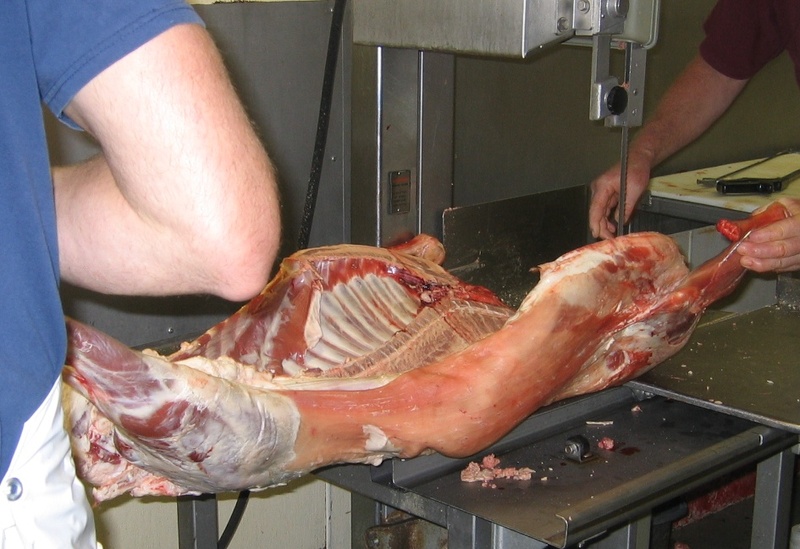 They raised the lamb, had it butchered and sent to the cutter that would follow the cutting directions below. We’d pay the cutter for the cutting service as we picked up the lamb, and Glen Gyle would send us a bill for the lamb. The final price was competetive with the local grocerey store. Laura’s got a couple Uncles that do this too so all four of us buy half a lamb, or two lambs total from Glen Gyle Farms. 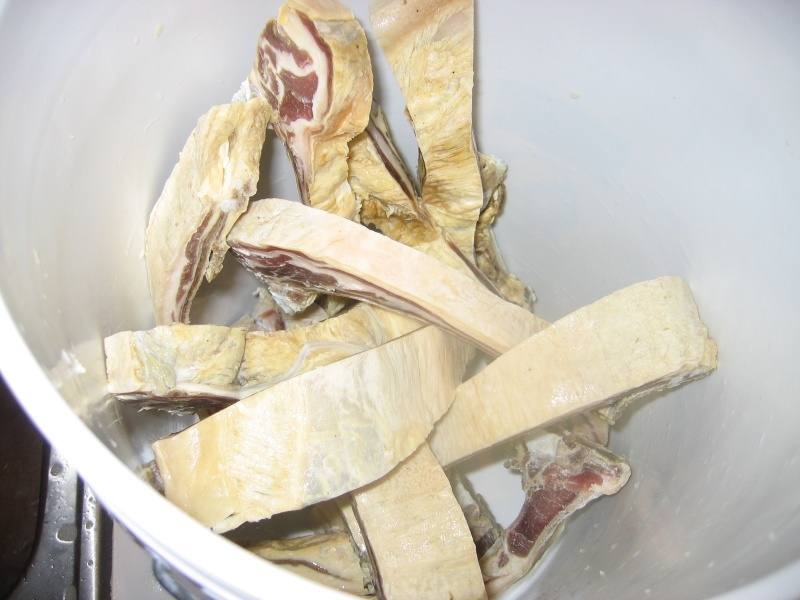 The primary objective is to leave the rib cage completely intact. Cut the lamb in half along the spine. Cut the rear leg off, carve into two roasts and wrap with string. They will probably be the best lamb roasts you’ve ever had. Keep and wrap the rear shank and bones for stew. Cut the front leg off leaving the rib cage completely intact. 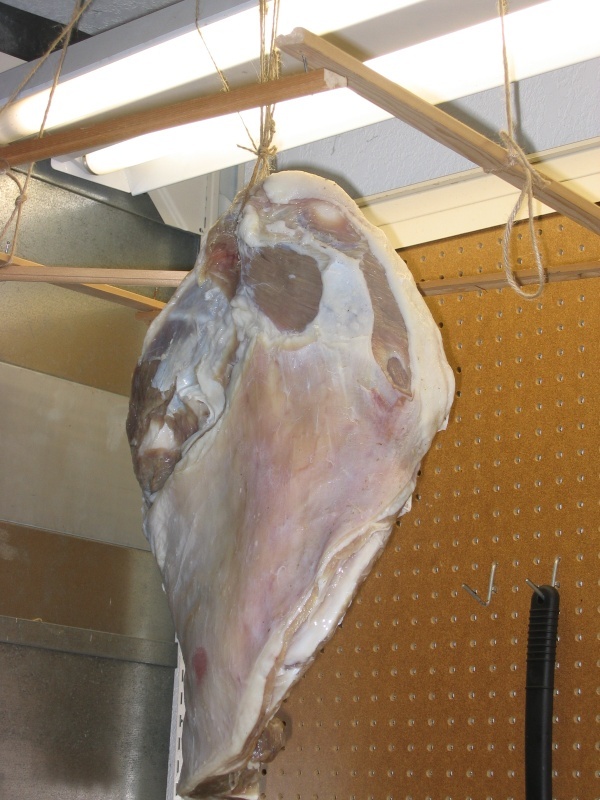 The front leg can be left whole for hanging like the pinnekjøtt below, this is called fenalår, or cut into 2” squares for fårikål. The neck is cut off leaving the rib cage completely in tact. This too can be cut into 2″ squares for fårikål. 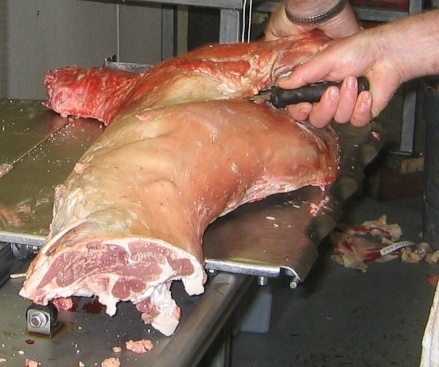 The loin is removed leaving the rib cage completely in tact. The loin is cut into 1” steaks and packed in threes. The flank is cut and packed. 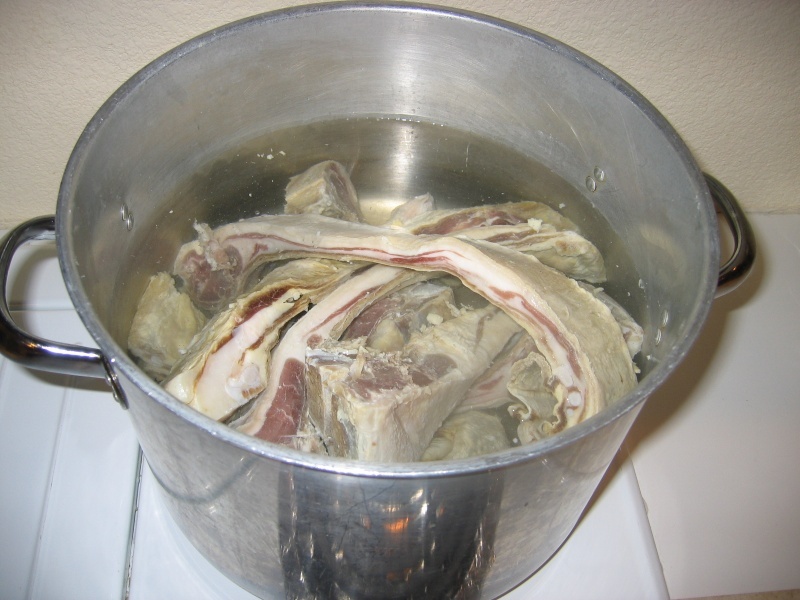 Kidney’s, heart, etc, can be saved for stew, kidney pie, or discarded . Now you’ve got a serious collection of meat, the most important being the rib cage. Curing the pinnekjøtt is the easiest part. 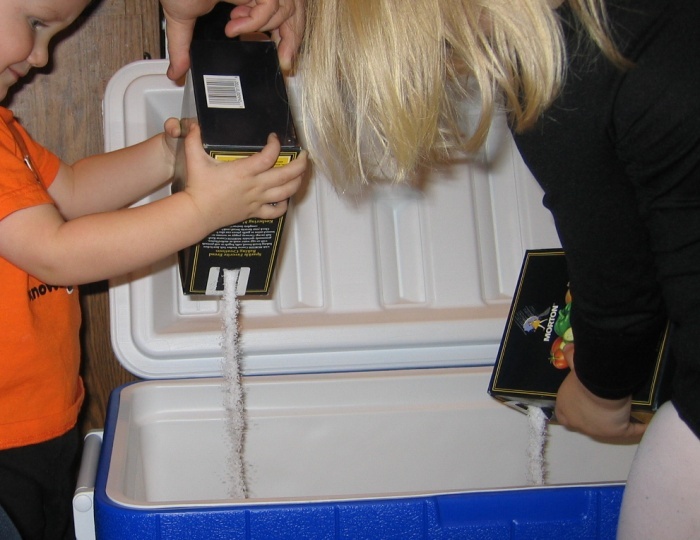 Get a clean picnic cooler and fill it about half way or with enough clean water to completely cover the rib cage. Get a medium potato and a medium nail. 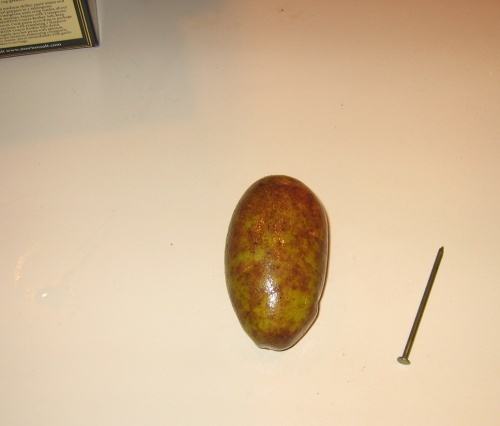 Put the nail in the potato and put the potato in the water. 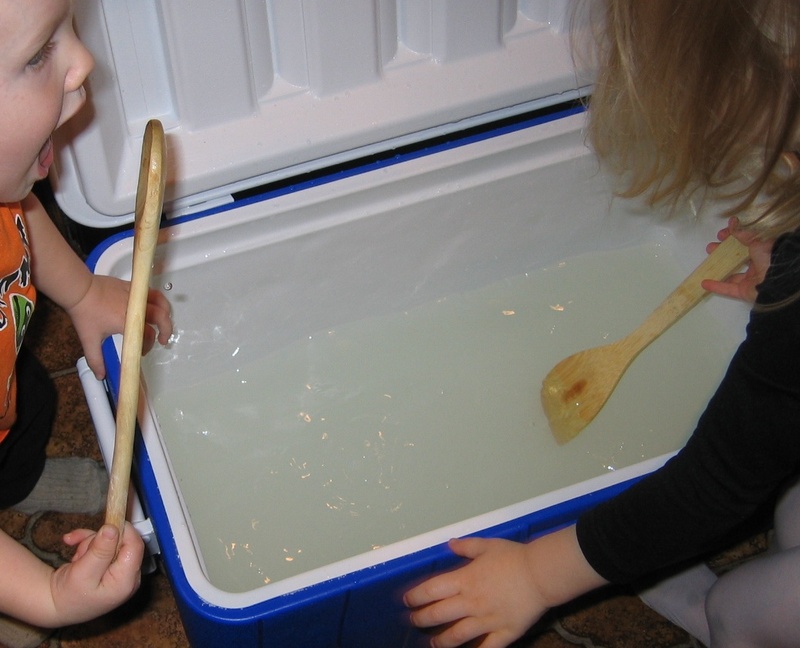 Start dumping salt into the water, stirring constantly. You’re done adding salt when the potato floats. This usually takes between three and four boxes of salt. Don’t drink the salt water, it’s not very tasty. Now add the ribs to the brine. You’ll likely have to weigh it down with a bowl of water. Put the whole thing in a cool garage and let it sit for three to five days. Remove the rib cage and run twine a couple times between two ribs creating a loop that you can hook to something. Hang the rib cage somewhere cool with some air movement. 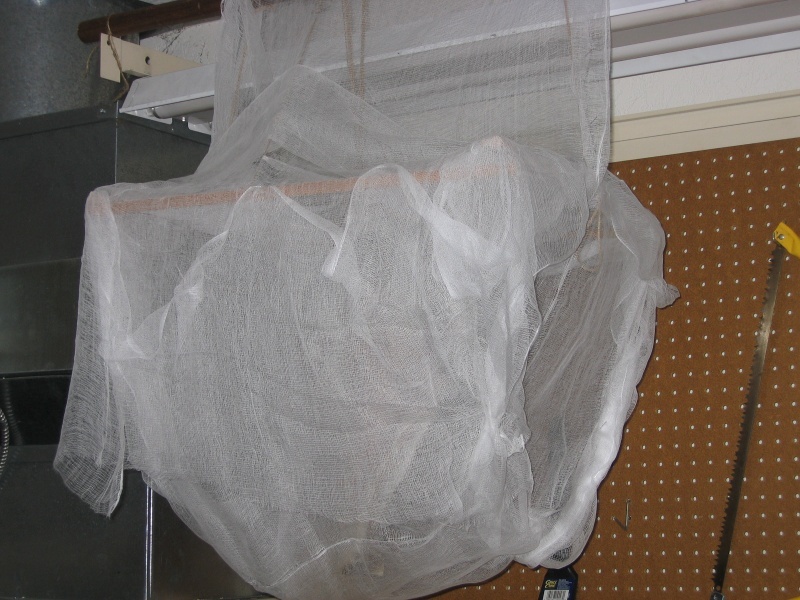 I simply hang it in our garage with the window open about four inches ( to let the fresh air circulate ) and point a small fan at it on a low setting. The hanging starts the end of the first week in November. It’s cut down Christmas Eve, about six to seven weeks. 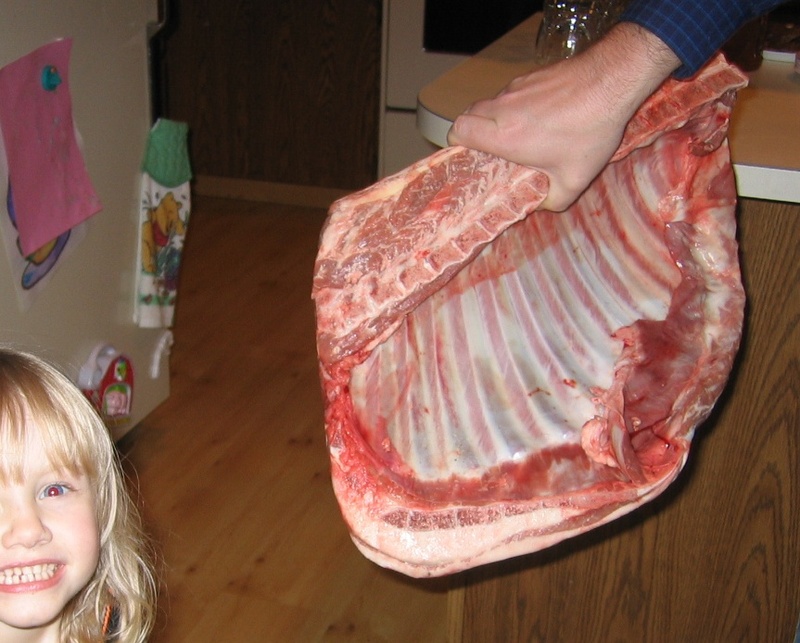 In past years, we’ve cut the lamb between the rib with a knife. 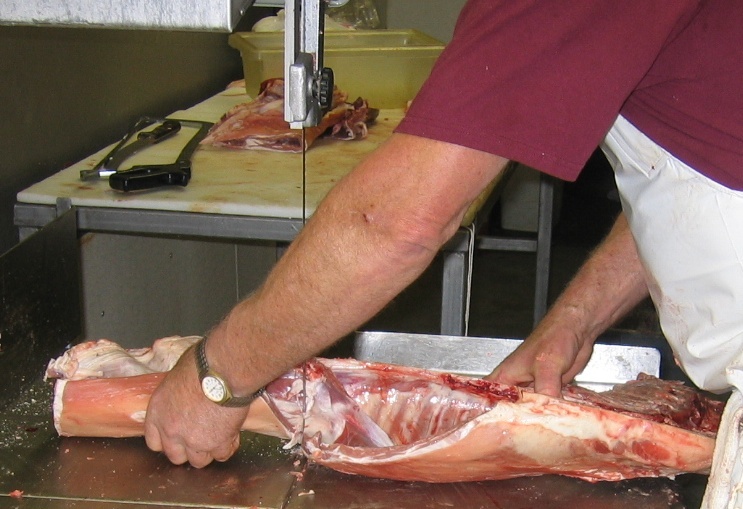 This is hard and requires one or two people to hold the lamb while someone else cuts. This is very hard and dangerous. This year we’re going to use a saws-all. I’ll let you know how it goes. 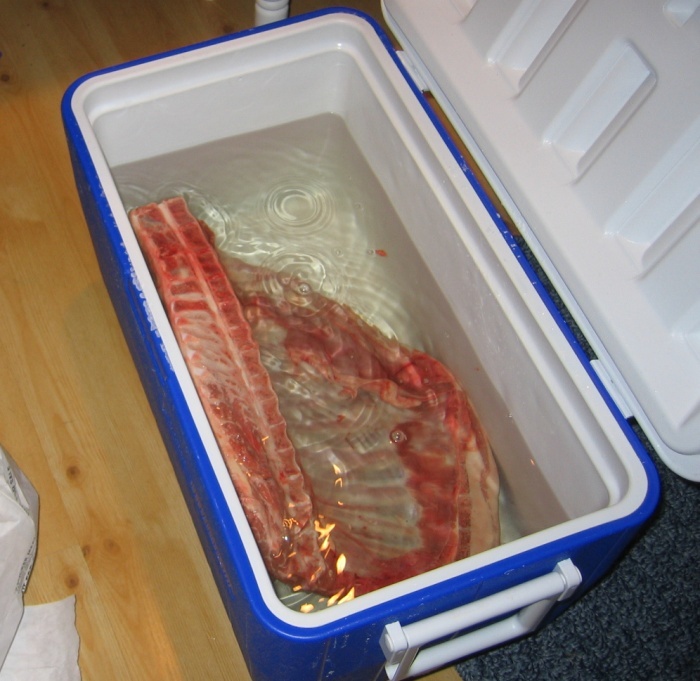 Take the cut ribs and soak them in fresh water for a couple hours. Place them in a pot and boil for an hour. Replace the water and let it continue to boil for another hour. We’ve done this for about four years now and (knock on wood) we’ve always had success. 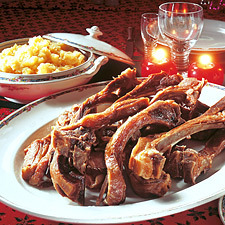 The taste is fantastic and is a great way to celebrate the holiday with the family.